Karl Strauss is a special brewery to me. I came to San Diego in the early 90s and the bar taps featured your standard mega American beer selections. Nothing with any dimension – just flabby, watery, pale fizz. When Karl Strauss hit the taps in San Diego bars, I was more than excited. This was the dawn of a new beer era in this town. I had hope. And judging by how popular and widespread the signature Amber Lager became, the locals agreed. The story goes a little like this: Founders Chris Cramer and Matt Rattner, fresh out of business school, convince Brewmaster, namesake (and cousin to Chris), Karl Strauss to come out of retirement and steer the controls of a new brewery. Chris and Matt go to work on the business and by February of 1989, San Diego’s first new brewpub in 50 years opened its doors. Brewers seem to be intrinsically happy people to me, and these guys aren’t any different. I meet Chris, Matt, and Paul Segura (Karl’s Head Brewmaster) at the main brewery. It’s a hot afternoon but the brewery is cool and breezy and music echoes through the space. Everyone looks happy, even the crew hosing the yeast foam down the drains on the main floor. Chris jokes that we should do some yeast-wrestling photos, while Matt suggests a slip-n-slide would be better. I’m all for it but instead I ask to shoot in the keg room where it’s a chilly 38 degrees F. We make a few shots (quickly) then Chris and Matt have to return to business. I pack my light kit while Paul pours me a 1/2 pint of Tower 10 from the filter tank. We talk about how far San Diego beer has come and its odd rise to fame. Paul has been brewing in San Diego for 20 years and been with Karl Strauss for the last ten. 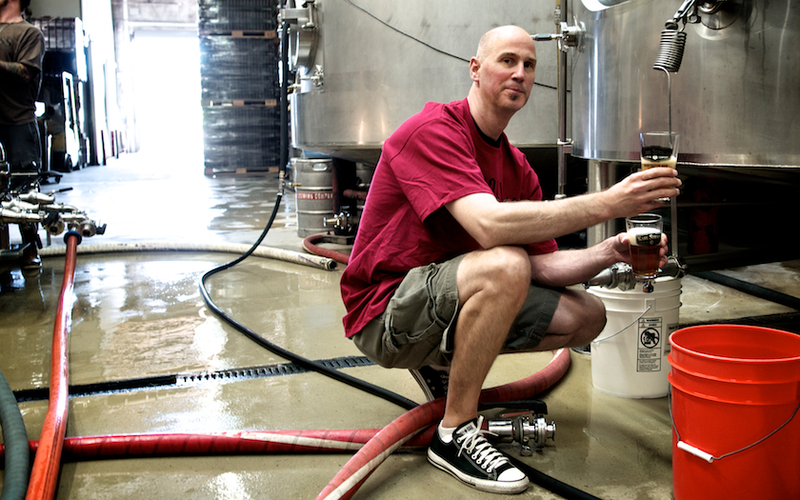 He’s helped the local beer scene go from Underground to Over-the-Top. He tells me how the recipes have evolved at Karl Strauss. In the earlier days, Karl insisted they keep the IBUs to a moderate amount, no more than 30. Now with Tower 10 clocking in at 60 IBUs, I can only wonder what Karl would think. I would be remiss if I didn’t mention the family of brew pubs. With six brewery restaurants going strong, they help keep their micro-brewery approach alive. Each restaurant has its own Brewmaster who is often brewing up his or her own recipes alongside the permanent selections. You’d be wise to stop in, grab a bite, and see what’s on tap at the various locations. 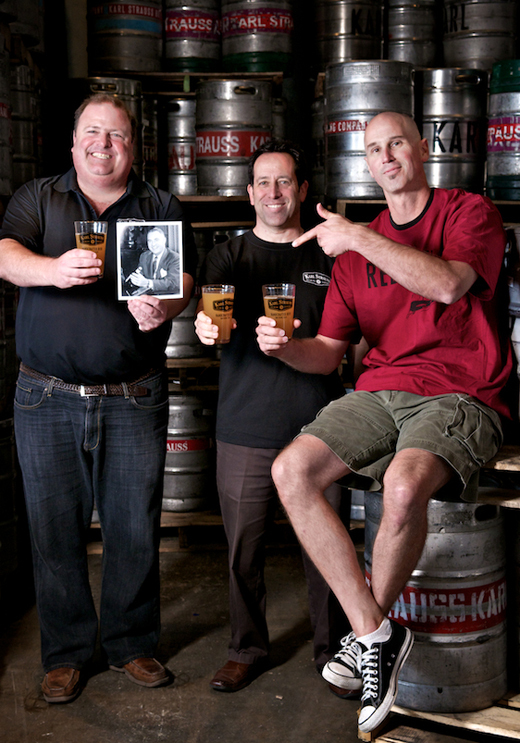 Sadly Karl Strauss passed away in 2006 but his namesake brew remains, for me anyway, the backbone of San Diego beer. Perfectly balanced, widely available, and always fresh. Cheers, Karl. Growler fills are available at Karl Strauss Brewery Restaurants. You can check out what’s on tap on their Beers page. Thanks a lot. Now I want good beer. This is awesome. Somehow food and drink tastes better when you know good people are behind it. Thanks for sharing their story, and can’t wait for the next one! Hint?